After struggling a lot I came on final conclusion that how we can run .jmx files using Ant and generate HTML report. Before I start the configuration just want to make sure you have following software downloaded and handy with you. Java 1.6 or next version of it. Now follow each step to complete the configuration and run the .jmx file using apache ant. 2) Download Apache Ant and unzip it. Copy the complete unzipped folder to C:\ drive. 3) Download Jmeter and unzip it. Similarly copy the unzipped folder to C:\ drive. Now you have Java installed, Apache Ant and Jmeter copied to the C:\ drive. 4) Open Jmeter folder and then open Extras folder shown inside Jmeter forlder : C:\apache-jmeter-2.13\extras. 5) Select all the files inside extras folder and copy it. You can use Ctrl+A and then Ctrl+C command to select all and copy. 7) Once copied all the files in C:\apacheant\bin folder search for build.xml file. 8) Right click on it and click on edit option. You can create text document by right clicking inside bin folder and selecting text document. Right click -> New -> Text document. Here you are almost set with all the changes. Now we will run the Test.jmx file which is already available in Apache Ant bin folder as you copied all the items from Jmeter extras folder. You can change the Test.jmx file with your own jmx but here this is just an example so I have taken the existing Test.jmx file. 13) Open command prompt in admin mode. You can open it by clicking on Start button and then type cmd in search box. 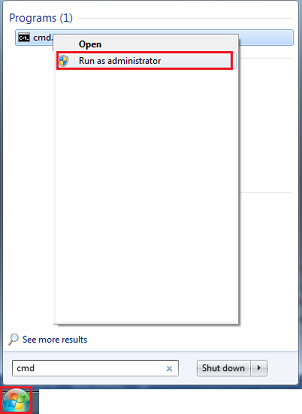 Right click on cmd.exe and click on Run as administrator. 14) While running in admin mode will ask you to inter your system password if any. If asks please enter the system password and then click on ok.
15) Type command cd (Your Apache Ant bin folder location) and hit enter button. 16) Type set path=(Path of you java bin folder) and hit enter button. 17) Type ant and hit enter button from you keyboard. Once you hit enter you build will start running and you can view the result as BUILD SUCCESSFUL at the bottom. 18) To view the detailed result go to Apache Ant bin folder and search for Test.html file. everything is nice and helpful, but getting error for Test.jtl file. (premature end of file). to resolve this please add below entry in Test.jtl file. everything is nice and helpful, but getting error for Test.jtl file. (premature end of file). to resolve this please add this entry in Test.jtl file. I am getting below error, any idea what I did wrong? [xslt] C:\apache-ant-1.10.1\bin\Test.jtl:1:1: Fatal Error! Content is not allowed in prolog. Hi, I am encounter the same error despite followed the exact steps. Have you solved your error? If yes, can you please help. Thanks. Can you please help me, I am facing the same error. Can anyone please post if you have resolved this issue. I want to create a separate html file at each run. May be by adding/appending timestamp for each html file. Looks like when we run ‘ant’ it deletes the existing html file. Can you share some insight for the same so for each ant run it generates a new html file keeping the old one as it is? I followed all the steps but i got this error.. I installed ant-jmeter-1.1.1.jar file and kept in extras folder of jmeter.. Still i am getting the above error..
[xslt] C:\apacheant\bin\Test.jtl:1:1: Fatal Error! Premature end of file. Suggest how to fix the issue.Thanks in advance. It’s simple, yet effective. A lot of times it’s quite hard to acquire that “perfect balance” between usability and appearance. me personally on Opera. Superb Blog! Could anyone pls. suggest how to fix the issue. appreciate your help at the earliest. Im getting the following during the build. I installed Ant and working properly. Any suggestion? Article was too good. Simply simple.